Strengths-Based Development : Your talents - those thoughts, feelings, and behaviors that come naturally to you - are the source of your true potential. The better you can apply these talents, the greater your potential to consistently act with more confidence, direction, and hope. Subscribe to Joseph's Good Monday Brief - sent directly to your mail box. Click on the left video for a sample. Strengths-Based Development : Focus on Strength. Manage Weaknesses. The strengths-based perspective offers a refreshing approach to leadership development by first focusing on your innate talent - your natural strengths which when focused upon enables you to perform consistently and nearly perfectly. Based on Gallup's 40-year study of human strengths through two million interviews of excellent performers, a language of the 34 most common talents was created called the Clifton StrengthsFinder assessment. People who do have the opportunity to focus on their strengths every day are six times as likely to be engaged in their jobs and more than three times as likely to report having an excellent quality of life in general. Strengths-Based Leadership : A one or two-day workshop to equip the executive with a strengths-based paradigm for discovering a "personal fit" for work and life. Leverage on the language of positive psychology to affirm team members. In addition, discover what it takes to build a culture of employee engagement leading to loyalty and retention. 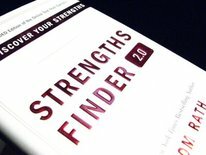 StrengthsFinder Coaching : A personalized or small group executive coaching founded upon a strengths-based approach. It is based on the simple notion that it is more profitable to build on one's areas of greatest potential rather than seeking to shore up weaknesses. There's nothing wrong with being aware of your weaknesses and managing them, but your greatest opportunity for success lies in building on your natural talents - not in fixing your weaknesses. StrengthsQuest for Teens : A one-day workshop to equip parents/guardians with a robust method for coaching their teenage son/daughter to discover career strengths and life purpose. Both parent/guardian and the teenager must attend together. This workshop is arranged on a "as required" basis i.e. we require a main organizer who will do all the relevant ground work of marketing, promotion, registration, etc. Your top 5 theme report with strengths insight descriptions. Click here to download a complete listing of all the 34 strength themes. 50 ideas for actions (10 for each of your top 5 themes) based on thousands of best-practices. A Strengths Discovery Interview that helps you think about how your experience, skills and knowledge can help you build strengths. A Strengths-Based Action Plan for setting specific goals for building and applying your strengths in the next week, month, and year. Click here to download a quick reference guide to Strengths Basics.